A while back, I decided that I would like to build a parallelogram binocular mount. After poking around the net, I came across the Astrowood HD mount designed by Roy Hess, a real stand up guy. His Youtube videos made it look like a great design, so I decided to build one myself, though without the use of metal brackets. Roy was kind enough to send me a variety of diagrams and pics to help me along the way, and his help was much appreciated. Below is a write up of my experience and pics of the more or less finished product. Most of the mount is made of maple, with the exceptions being the azimuth mounting brackets which are chestnut, the azimuth block which is oak, and the pivot handle which is pine. I first made just the mount without the azimuth base. My original plan was to just use the azimuth motion of my Manfrotto camera tripod to allow for rotation. Unfortunately, it was not quite up to the task for holding such a heavy mount. It worked pretty well, but it was still a bit wobbly. More serious was the issue of the motion. Originally, I used nylon washers to act as spacers between all the pivot points. The result was exceedingly jerky motion that was totally unacceptable, and quite frustrating at this stage of the project when I expected everything to be moving along nicely. After looking all over locally for a solution, I ended up buying a 12x12 sheet of 1/16 inch teflon online, and cut new washers for the 12+ pivot points. What a difference! The mount immediately went from a jerky, irritating piece of junk to an absolutely butter smooth, precision machine. Let that be a lesson to anyone who wants to cheap out and use nylon instead of buying teflon. After solving that issue, I turned to the matter of building a solution to the wobbly azimuth. As luck had it, a friend of mine was tossing his surveyor's tripod whose quick release leg adjusters had broke off, and he donated it to the project. I replaced the failed quick clamps with bolts and wing nuts, disassembled it completely, cleaned it up, and painted it with hammered black spray paint. From there, I created a ridiculously thick azimuth bearing consisting of a sheet of teflon sandwiched by two maple discs. (I was going to make a mini-dob base with ebony star, but it ended up not being necessary.) Getting these discs and the teflon to be perfectly circular and concentric to the pivot bolt was challenging, given their thickness. I ended up using a circle jig to cut them on the bandsaw, and then the same jig to fix all the imperfections on the oscillating spindle sander. All in all, I'm quite pleased with how it turned out. It's quite heavy and unwieldy, but it works great. It's rock solid, dampens quickly, and you can raise and lower the binoculars without losing sight of your object which is great for sharing the sky with people of different heights. Now I just need a motorized base so I can drive it to the star party, rather than lugging it by hand! Thanks again to Roy Hess for the help along the way. Beautiful craftsmanship, Nathan! Very well done job. I hope you enjoy it for a long time! Wow, that's excellent! I need to make one myself!! I am curious about your reporting that nylon washers gave "exceedingly jerking motions". I have made a number of wooden binocular mounts and have never experienced this. The nylon washers I used were at least an inch in diameter and smooth on both sides. Perhaps your washers were too small in diameter or the joints too tight? I found a VERY similar design online several years back and built one like this one, as well. I use my 20 x 80 binocs on it, so I have a heavier-duty tripod than the one shown in your photos. I really enjoy using it! Yours, however, has better design and workmanship in the details! It's a great activity to build working equipment for this wonderful hobby!! Let that be a lesson to anyone who wants to cheap out and use nylon instead of buying teflon. As mentioned above, You can have satisfactory results with nylon - I have also tried polyester, Copolyesters, and others - but Teflon sure beats them all. When making disks, I rough cut then with a jig saw and then use round patterns, with a pattern bit, on a router table. Again - nicely done, thanks for showing us ! Thanks for everyone's comments! They are much appreciated. As for the nylon, I suppose I exaggerated a bit, but not by much. They were indeed large spacers, about 1 inch in diameter, but they just didn't cut it. They seemed to work OK if the tightness of every pivot point was just perfect, but any variation in that would cause it to get jerky and/or bind if it was too tight, and slip if it was too loose. And, of course, the knobs would always loosen a bit with use, requiring frequent adjustments. After switching to teflon, all these troubles went away. But YMMV. Very acomplished woodworking! beautifully done. Thanks! I don't know how accomplished I would call it though, since this was my first real woodworking project ever. (Unless you count the jewelry box I made for my first girlfriend when I was 15. ) Years of watching the New Yankee Workshop really paid off! Good practice for building a dob in the future, that's for sure. Sorry to resurrect this old thread but I wonder if you could please confirm how you fix the azimuth bearing to the tripod? maybe it's one bolt through the whole thing like a dob base? it's a superb job and I'd like to make one myself. Now the question. Does this mount make binocular viewing much more satisfying? Beeen thinking about one myself. Lovely. Is that wooden stick that sticks out below the binoculars and has a wooden square on it a counterweight, or a handle, or both? Looks more to be a handle. If anything, from the standpoint of counterweighting in the elevation axis, this 'stick' would appear to actually add more weight than needed. Were the altitude motion to be frictionless, I should think the bino would tend to swing down toward the horizon. From the photos, I get the impression that the bino's center of mass is already a little below the altitude axis, and given the additional mass of the supporting wooden "L" bracket, the tendency already is there to swing-to-level. Of course, the 15X70 bino is to be considered small-ish. An 80mm bino, and especially a 100mm unit (if it can be handled), would tend to better balance things out. I used roughly your dimensions (I used the binos in the photo for scale). The result is pretty heavy. My upright posts are 1" Baltic birch, and the other strips are 0.8" cherry from a recalled crib (someone was giving the wood from it away on craigslist). I am wondering how one would choose a surveyor tripod that can handle the weight well. Well, I built my version of this one. Major differences: My woodworking is looks terrible. But it works. :-) Minor difference: instead of that L-shaped bracket for the binoculars, I use a single piece semicircular plywood arc. The advantage there is that the binoculars bolt right to the arc, and so there is no need for a metal bracket. The azimuth is a scaled-down dob azimuth bearing, with three PTFE pads bearing against a CD. The counterweight is a bubble wrap envelope filled with sand and duct taped all around. It looks absolutely hideous, but it is an important safety feature in case I bring it to a star party and a kid whacks another kid on the head with the counterweight end. The long pieces of wood are cherry from a recalled crib that was given away on Craigslist for scrap wood. The short upright pieces of wood are 1/2" Baltic birch, laminated to double thickness. The tripod is very low--less than two feet--and the legs are made of 1.25" PVC conduit, joined with webbing from a discarded carseat. (I plan to use this mount only while seated.) The tripod seems pretty stable, but if necessary, I can fill the legs with sand. I am having two relatively minor problems. First, there is some flexing in the long arms that reduces the steadiness of the mount. Second, there is a bit of torsion in the upright Baltic birch piece that is over the azimuth. omg, a beautiful piece of craftsmanship there. 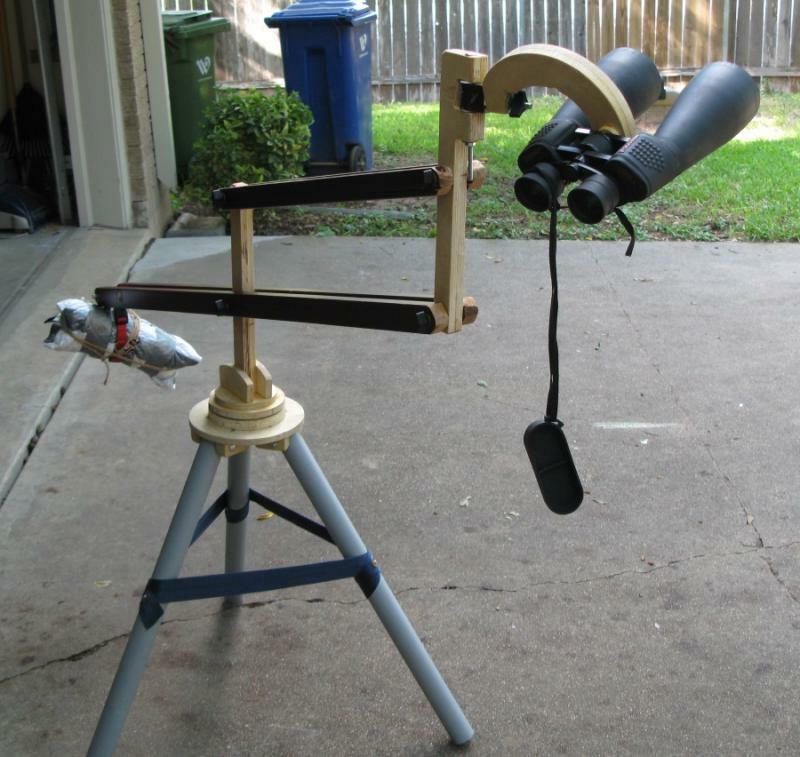 I'm new to amateur astronomy and have always found it a bit funny to think that people are trying to build their own telescopes and mounts, but you've just shown me how do-able it actually is! You never know, I might just build my own mount for my celestron Nexstar 8 se. I'm guessing people don't build equatorial mounts though? I hate not being able to track DSO's properly with my alt-azimuth mount. Anyway, good job - thanks for the pics, very inspiring. After seeing your pix and writeup on your "bino-mount" I am INSPIRED and am wondering what dimensions of lumber did you use...? I'm guestimating approx. 1" x 3" on the four horizontal arms, and perhaps 2- 3" square on the two vertical posts? One more question if I may, what diameter and thickness of teflon did you use for the eight (four joints) pivot points? Many thanks for sharing this with us all! Hello again everyone! My apologies for my long absence. I'll do my best to answer all the questions adequately. Could please confirm how you fix the azimuth bearing to the tripod? For my particular setup, the bottom half of the azimuth bearing is affixed via three screws from the bottom of the metal tripod. That is to say, three screws go through the metal of the tripod, up into the bottom base. That being the case, the top half rotates over the non-moving bottom half. A single large carriage bolt then goes through the top bearing and the bottom, with a nylon lock nut to hold it all together. (The bolt is encased in a brass sleeve, so the rotation doesn't wobble, wear down the wood, or catch on the threads.) Since the nut is on the bottom, it is easy to adjust in the field, though I've never had need to. Significantly so! It really is a world of difference when you get this setup next to a nice reclining chair. It almost makes sharing views actually possible. It all comes with a huge price though....heft. This thing is a beast, making transport non-fun. Is that wooden stick that sticks out below the binoculars and has a wooden square on it a counterweight, or a handle, or both? It is indeed nothing more than a handle. Well, I built my version of this one. Great job!! I really like the look of the arc. It certainly does not look terrible! The reduced amount of wood is definitely a good thing. If you think yours is heavy, you should lift mine - it is a terrible beast In fact, I barely can muster the will to bring it along with all my other gear to star parties - it usually stays at home, unless it's a true dark site party. Anyway, nice thought about the bubble wrap. Your tripod is simply ingenious - I love that kind of stuff. As for your minor problems, have you figured out any fix yet? I may have a few ideas if not. I am INSPIRED and am wondering what dimensions of lumber did you use...? A lot of the stock came from leftovers I had lying around, so I just went out to the garage and took some measurements with the ole' trusty tape measure. The four horizontal arms are 1.5" x 13/16ths. (1/16th more than 3/4 inch.) The two vertical posts are 2" x 1 3/4" exactly. I'm afraid woodworking beauty and ease of transport/light weight are mutually exclusive. If I was going to build one of these again for serious back and fourth star party use, I would have made it out of metal, and made it break down into much smaller pieces. As they say about dSLRs vs point and shoot cameras: the best camera is the one that you use. If your dSLR sits at home every outing due to sight and weight, it's not for you! What diameter and thickness of teflon did you use for the eight (four joints) pivot points? The teflon is 1/16th thick, and for each bearing surface I cut out roughly 1" diameter fender washers to go around the bolts at every place wood touches wood. I bought it from this site here: link. Specifically, I purchased 12x12" of BB96625. Shipped to my door it was $21.68. And as I said in my original post, it turned the mount from a clunky, jerky piece of junk with the nylon spacers to butter smooth perfection with the teflon. Don't skimp on this! Anyway, I think that catches me all up. I've added this post to e-mail notifications, so I'll respond faster than 4 months if anyone has any more queries. Thanks for everyone's kind comments! The arc is an idea I'm proud of. I had a lot of scrap plywood circles from another project. One got used for a Spirograph board for the kids (with two nylon bolts to go through the paper and hold the gear in place), one got used for a brake for my 13", and one got used for this. Mine is pretty convenient. I initially thought I'd have to remove the mount from the tripod to fit it into the car, so I took care to have nice tool-free knobs for attaching the mount to the tripod, but it turns out it all fits on the floor of the back seat of our Taurus. The tripod is too short for use while standing up, unless you're a kid, but I don't like observing standing up. Thanks! I've since added some springs to spring the legs apart. This way, I can lift the whole thing as a unit, and its legs stay more or less open and then gravity pushes them apart when I put them down. This is important as my backyard has lots of trees, so I need to move it around a lot. The old setup required me to manually spread the legs at each location, which required a balancing act. The torsion on the central column was mostly fixed by gluing some oak pieces on both sides of the column. The whole thing moves a little too easily--if I hold the binoculars, my hand vibrations get transmitted. If I let go of the binoculars, it stabilizes. I guess it's all those PTFE washers. I've also been wondering what the pros and cons would be of shortening the counterweight arm and increasing the weight. It would make the mount heavier but more compact. The teflon is 1/16th thick, and for each bearing surface I cut out roughly 1" diameter fender washers to go around the bolts at every place wood touches wood. I mostly used these PTFE washers from Amazon's Industrial and Scientific store (where I get most of my parts), though I bought them in smaller quantity. I happen to think its wonderful that you've taken all the time and trouble to share so much information on your project, Nathan! Two more brief queries, if I may, regarding dimensions.... what are the respective lengths of your horizontals and vertical units in this mount? Many thanks, AGAIN, for your kindness in sharing! My pleasure! And no worries about the forum, it all goes to the same place in the end. And again, I made all of this up as I went along. The design is fairly forgiving, so don't take these numbers to be set in stone. Nathan, most patient and good-natured fellow sky-searcher: at the risk of wearing out my welcome, my curiosity has been in overdrive while working on my own parallelogram. I apologize for all the questions, and in karmic remittance, valiantly plan to post my results when my own "franken-ellogram" for binox is completed! Did you contemplate and/or use brass or bronze bushings where all the "pivot" bolts travel through their wood locations? And if so, did you place them in the horizontal members as well as the verticals? IMHO, the use of bushings (an added $30 expense) might well be worth the expenditure, seeing how the materials used are all very different in their nature (just as forum users are). Thank you, as always, in advance, for sharing your valuable time! No problem! Glad to answer any questions in perpetuity - I've certainly asked my fair share. All the bushings were made with a mini pipe cutter (don't even bother with a saw) and some of that telescoping brass tube stock that you can buy at hobby stores. Just used whatever fit snuggly around whatever bolt I was using. I don't believe I put them on the main horizontal parallelogram bearings, since they move so much less, and the force is evenly distributed across 4 separate spindles. Bushings make a huge difference though. They really clean up the motion, and are worth doing for sure. Without a bushing, my azimuth bearing moved unevenly and off center slightly. The bushing fixed that up nicely.